Spello and Assisi Tour Includes: Private transportation, service of an English speaking driving guide, local expert guide in Assisi, tolls, parking, taxes. This guided day trip from Rome combines two lovely destinations in Umbria, Spello and Assisi. Our private tours of Assisi and Spello are available from Rome and other parts of Italy. Inquire. Our Spello and Assisi tours starts in Spello, one of Umbria’s most enchanting little hill towns, and truly a joy to stroll and visit. The town is a mix of styles, from Roman to medieval; you can visit the Santa Maria Maggiore church to admire frescos from the Renaissance painter Pinturicchio. There is also a nice gelateria/bar right with a comfortable terrace outside the city walls where you can stop for some gelato or a drink. 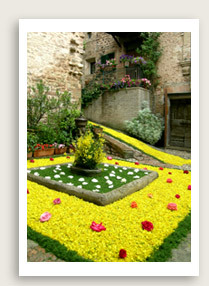 In this private tours of Assisi and Spello, you will also tour Assisi. You will arrive just in time for lunch before your private guided tour begins in this beautiful city. You will start from the town’s heights, stopping at the church of St. Claire, a great example of Italian Gothic architecture containing precious paintings, the famous crucifix venerated by St. Francis, and St. Claire’s crypt. You will move towards the old Roman forum, where you can see the 1st-century Roman temple of Minerva, the 13th-century Palazzo del Capitano del Popolo, and the 14th century Palazzo dei Priori. You will finally take the main road downhill to the main attraction of Assisi, the Basilica. The Basilica, begun two years after the death of the saint in 1228, is composed of two churches and a crypt housing the Saint’s tomb. The lower Basilica was decorated by the greatest painters of the 13th and 14th century: Cimabue, Giotto, the Lorenzetti brothers, and Simone Martini. The upper Basilica is adorned by Giotto’s frescoes illustrating the life of St Francis. You will enjoy wandering around the beautiful streets and take advantage of town’s perfect position for a fantastic view of the Umbrian valley.